I recently was given this Squier Bullet Strat to work on by a customer who knows what playing a great guitar is like (the man owns a Rick Turner Model 1). 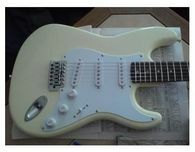 He sent it along with a new pickguard, knobs, bridge saddles and a set of Planet Waves Tuners. He wanted everything installed plus a complete setup on it. I must say that his choice of colors for this guitar was excellent! After putting it together and doing a set-up it looked and played great but the pickup covers were still white, and let's face it, the Squier Bullet doesn't have the greatest sounding pickups in the world. I told him about a set of vintage wound pickups I had that had black covers on them and he told me to go ahead and put them on. With the new pickups this guitar played and sounded excellent, in fact the only thing holding it back was the plastic nut which was muting the strings a bit. So one night when the family was out and I was bored I went ahead and cut him a bone nut which gave this guitar the finishing touch both looks and sound wise. You can find these guitars used for under $100 all day long. Add some quality tuners, saddles or bridge, a new nut and some decent pickups and you have a serious guitar that cost you under $425 with labor and will blow away any $600 Mexi-Strat out there.